This product is case packed in quantities of 24 per carton. A break carton fee of $11.00 will be applied to orders that are not placed in case denominations of 24 units. This memo holder offers a unique look that can hold your photo, signage, or note on a counter or table top to be easily read. The office alligator clips have a weighted base that is made from black plastic with a sphere design that fits in well with all environments. The stable display is typically used in retail stores, bakeries, and shopping centres to show pricing information or identify merchandise. A promotional desk display, memo holder is also great for displaying memos to read from in offices, or hold table numbers in restaurants or at wedding reception halls. 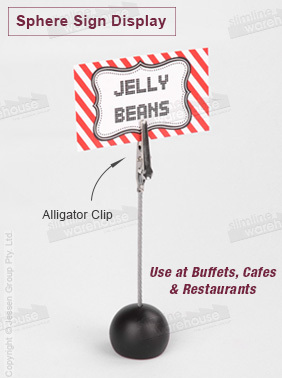 A wire attached to the plastic base holds an alligator clip that holds signage during display. Serrated teeth provide a firm grip on items of different thicknesses to keep them in place. The stand is 120mm tall, making it easy to read signage when placed next to merchandise or amongst décor on a table. By browsing through our online catalogue, you'll see the hundreds of items we are currently offering that are in a variety of categories to best fit the needs of businesses. Slimline Warehouse has been in business for over 20 years, with same day despatch offered to Sydney, Melbourne, Hobart, Adelaide, Brisbane, Gold Coast, Adelaide & anywhere else in Australia with purchases made by 1pm EST!